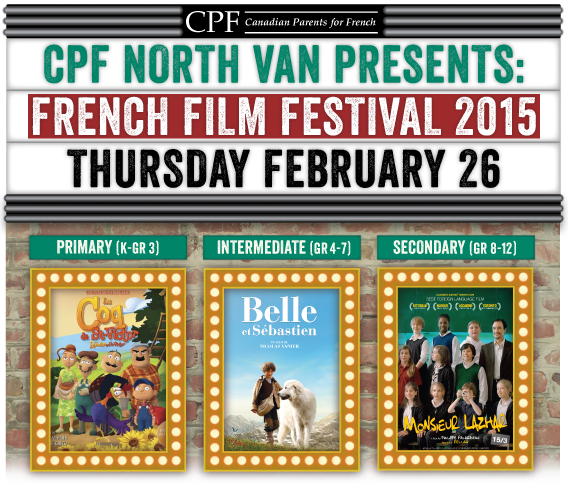 Great reviews: CPF North Vancouver’s 2015 French Film Festival! On Thursday, February 26, 2015, over 1800 French Immersion students, teachers and volunteers from North Vancouver schools converged on Landmark Cinemas Esplanade to watch three wonderful French films! Thank you to all the students, teachers and volunteers from Argyle, Boundary, Braemar, Cleveland, Dorothy Lynas, Handsworth, Larson, Ross Road, Sherwood Park and Windsor schools for participating in this event, we hope you enjoyed the films! This exciting annual event provides an opportunity for North Shore students to enrich their French-language studies and exposes them to French culture and French language use in a different context by viewing current, quality French films. In this fun family comedy, a village rooster’s punctual (and loud!) crowing keeps everyone awake until a group of sleepy locals hatch a scheme to get rid of him. Then regret it. What to do? Based on a popular children’s book by Quebec author Johanne Mercier. During World War II in the French Alps, Sébastien, a lonely but resourceful child boy tames a huge wild dog and so begins a story of enduring friendship. Together they try to foil a Nazi plan to capture French resistance fighters. Based on the classic French children’s novel by Cécile Aubry. A tender and thoughtful portrait of a man with hidden grief and a compelling exploration of the teacher-student dynamic as each struggles with a reality shaded by euphemisms, secrets and loss. The film was nominated for the Oscar for Best Foreign Language Film at the 84th Academy Awards and won many Canadian and international film awards. Next Next post: Read the latest issue of CPF Magazine!